During the final months of the war the number of prisoncamp deaths rose alarmingly. 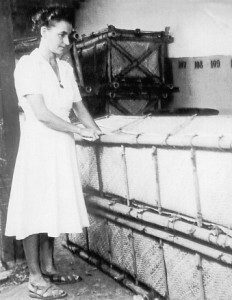 The camp was forced to make its own coffins from bamboo because of a shortage of wood. There were numerous reasons for the high incidence of death. The dramatic overcrowding of the camp during the final months accounts for much of this. 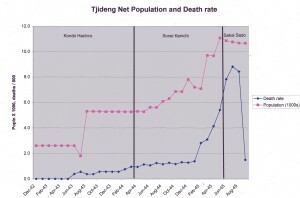 In the graph the net population is in thousands and the death rate in deaths per thousand. Under Captain Sonei the camp not only doubled in size over which he perhaps did not have full control, but he aggravated the situation by shrinking the area of the camp by 50%, with a cynical disregard for the consequences or displaying a level of stupidity that defies description. Using as a guide the August population of our house of about 110 persons, and assuming a design capacity of 5 -6 persons per house (including prewar domestic staff) it follows that the camp held twenty times as many people as the accommodation was designed for. 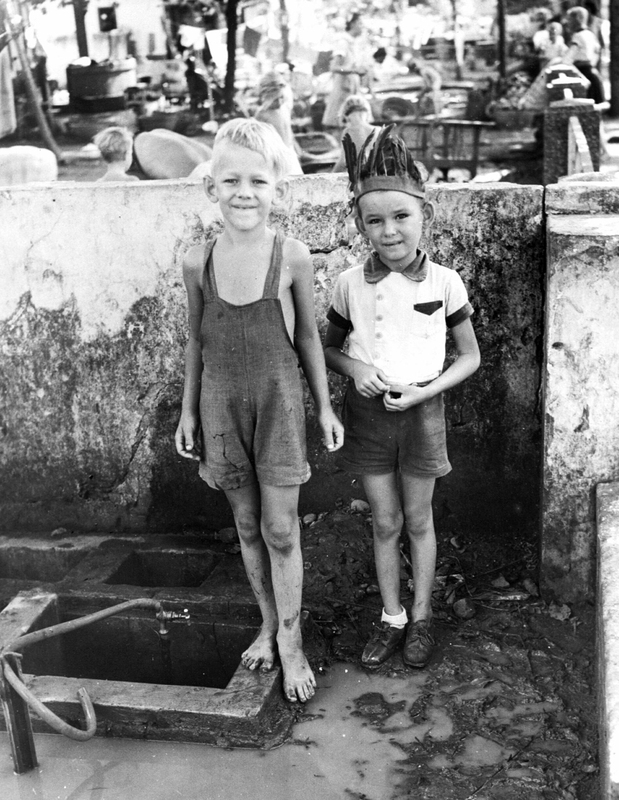 The resultant lack of privacy had a terrible impact on the mental state of the internees but this problem paled into insignificance when hygiene is taken into consideration. Neither the drinking water supply nor the waste removal system was remotely able to satisfy the need of the ten thousand inhabitants. The camp was a stinking filthy Hellhole. Disease was rampant, and the mortality rate exploded. Added to this litany of ills was a catastrophic shortage of food, and only equipped with an improvised medical facility housed in a school building located within the camp. This “hospital” was starved of the most rudimentary needs such as water, soap and linen. The biggest killer was dysentry. The Japanese Imperial army courted the risk of a disastrous epidemic in Jakarta. Camp Commandant Sonei was executed as a Class B war criminal mainly on account of his personal brutality towards the internees, but given the above picture he can be portrayed as a scapegoat on behalf of the entire Japanese Imperial Army. Only the very strong and those who were lucky late arrivals ( like myself), and therefore in better health, survived. 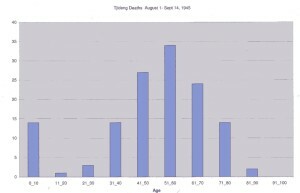 This is illustrated by the next graph which describes the demographic of the deaths for the period August 1, September 14 1945. What is striking about the attached figure is that death during these last months of the war came predominantly to the very young and the older inmates. Teen age girls and young women between twenty and thirty years-old stood the best chance of survival. The population of boys was tiny due to removal of all males older than ten. That the graph peaks for the age group fifty-one-sixty in itself speaks volumes: many of those of higher ages had succombed earlier on in the war, while camp commandant,Â Sonei Kenichi, had as well during his tour of duty selectively removed from the camp the doomed elderly sick prisoners, no longer at risk of escaping, to die in hospital camps elsewhere on Java, where conditions were no better. Cynics observed that this tactic absolved him from responsibility for an even higher death rate. 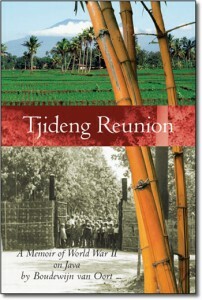 He was re-assigned to Bandung on June 24, 1945 and promoted. One Response to "Prisoncamp Deaths"